Q: We live in the city limits, on a creek, backing to a golf course and have no dog. We are literally plagued with rabbits, have spent hundreds of dollars buying blood meal and a spray that is supposed to control deer, squirrels and rabbits, in addition to hundreds of dollars replanting jasmine in our flower beds. Now we have found a hole in the scrubs where, we suspect, the rabbits have dug a warren. Since we live in the city a pellet gun is out of the question. And, yes, we have had city owned traps in our yard at length and the rabbits just go around the traps. What can we do to control this situation? Brenda K.
A: Spray the plants with Tabasco sauce at 1 oz. per gallon of water. Research? Yes, the original tests were done on agricultural crops in Amsterdam. Dutch farmers have found a hot new way to keep rabbits, birds and rodents away from their crops. 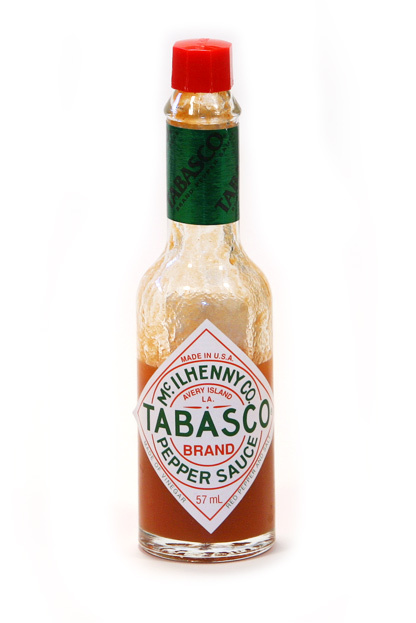 Tabasco sauce. The new initiative seems to be making everyone happy. Another product available in stores is Rabbit Scram. Rather than spraying, Rabbit Scram is a natural organic granular repellant that is effective and safe to use around children, pets and your vegetables. Tabasco sauce appears to be the best solution. Here is some back up for the idea. The Dutch animal protection society is happy with the spicy repellent, unworried by the possibility of burned bunny mouths. "Preventive measures are exactly what we want. It's better than going into the fields with a shotgun," said animal welfare spokesman Niels Doorlandt. Can you spray this tabasco/water mix on tomato plants? Is there any vegetable that it cannot be sprayed on? Does it hinder the growth of the plants in any way? Does it change the taste of the vegetables or does washing carefully remove it? 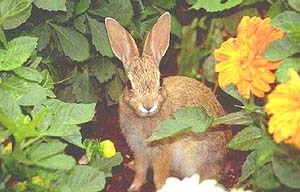 PLEASE respond ASAP as my garden is up and growing and will be destroyed soon by all the rabbits!